At 5.4 oz and 4.5 in. tall, waterproof ResQLink(TM)+ broadcasts registered distress signal that tells rescuers where sender is and who they are during life-threatening emergencies. Onboard 66-channel GPS can fix sender's position to within 100 m and then utilizes 406 MHz signal to relay distress call to orbiting satellites. As local search and rescue team is deployed, separate 121.5 MHz homing signal and integrated LED strobe light guide rescuers to sender's exact position. 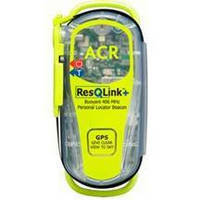 Small and light enough to hold comfortably in one hand yet powerful enough to guide rescuers to within 100 meters or less of your position in a life-threatening emergency, The ResQLink(TM)+ 406 MHz Personal Locator Beacon (PLB), manufactured by Cobham Beacon Solutions-ACR Products, receives Cospas-Sarsat approval. At just 5.4 oz (153 g) and 4.5 in (11.4 cm) tall, the ResQLink(TM)+ offers a lot of punch in the smallest, lightest and inherently buoyant package available today. It combines ease of use and ACR technology to give marine enthusiasts a powerful and accurate safety companion, ready for action at the simple push of a button. Raymond Harvey, Operations Manager of Air Sea Safety says, "The new ResQLink(TM) is a great investment and long waited pocket sized GPS equipped PLB that floats". As well as being inherently buoyant the ResQLink(TM)+ also features two unique fixing loops for easy attachment to a lifejacket or PFD with the supplied fixing strap. With three levels of integrated signal technology-GPS positioning, a powerful 406 MHz signal, and 121.5MHz homing capability-The ResQLink(TM)+ quickly and accurately relays critical emergency position to a the Cospas-Sarsat International worldwide network of rescue satellites. The waterproof ResQLink(TM)+ broadcasts a unique registered distress signal that not only tells rescuers where the sender is, but who they are. The onboard 66 channel GPS can quickly fix the sender's position to within 100 meters and then utilizes a powerful 406 MHz signal to relay the distress call to orbiting satellites. As local Search and Rescue is deployed, a separate homing signal and integrated LED strobe light guide rescuers to the sender's exact position. Two built-in tests allow users to routinely verify that the ResQLink(TM)+ is functioning and ready for use-with the push of a button, users can easily test internal electronics and GPS functionality. Advances in circuit board design and power management have allowed for a smaller battery pack and continuously operating strobe. A PLB is a satellite-signaling device of last resort, for use when all other means of self-rescue have been exhausted and where the situation is deemed to be grave and imminent, and the loss of life, limb, eyesight or valuable property will occur without assistance. All beacons must be registered. There are no monthly service fees required for 406 MHz beacons. Air-Sea Safety, established in 1983, is dedicated to the highest equipment serving and sales standards in our industry. We offer over 25 years' experience in life rafts, vessel safety, and rescue equipment. Air-Sea Safety is approved by all major international maritime authorities including the US Coast Guard, ABS, Lloyds, DMV, NK, BV and many more. Our professionally trained sales personnel can assist you with selecting the right inflatable boat, the correct liferaft or PFD to meet your specific needs. All professionally trained technicians are required to maintain current certification on all products serviced and adhere to Air-Sea's strict quality control standards. In addition, we personally will work with you to ensure that your boat or ship is adequately outfitted to ensure maritime safety and security. All repairs and inspections are completed in our state-of-the-art approved facility to guarantee that all equipment is operational and exceeds its safety standards. All products are backed by a manufacture's guarantee and Air-Sea will ensure that each product is maintained accordingly. Come see the experts for quality and service you can depend on. Over 25 lives saved and counting. Heavy Duty Rescue Pole supports pick-off rescue operations.